Real Good Fish | Fishing Method | | Fishing Method | Bringing you the freshest sustainably caught LOCAL seafood! Boats equipped with up to 20 individual lines tow lures behind them at a set speed in order to target particular fish species. The speed, depth, and even color of the lure can be changed depending on the desired catch, when fishing for albacore the lures are towed between 4-8 knots to target those fast moving species. To target salmon, the boats troll with bait, at much slower speeds, and much greater depth. Many trolling vessels range up to hundreds of miles off shore, and on a daily basis it is possible to catch hundreds of fish once you find the large schools. Pros Like rod & reel this is a highly selective method to catch only specific species with little to no impact on the bottom. Cons This method allows fishermen to catch large numbers of fish, and in many places they target the younger fish. 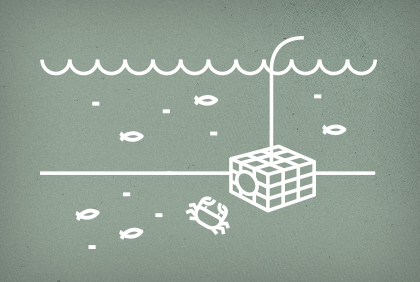 Traps are a great way of fishing, especially for crustaceans, including crab, lobster, and shrimp. The trap is baited and placed on the seafloor to “soak.” Target species come from the surrounding area to feast on the bait, and when the fisherman hauls the trap up he can then selectively keep the large animals and throw back the smaller ones (or females). This allows for more selective fishing, and improves the sustainability of the overall fishery. Pros Catch can be kept alive all the way to the consumer. Minimizes environmental damage compared to traditional bottom trawling, and also reduces bycatch. Cons Some traps are baited with fish caught elsewhere, leading to unnecessary stresses on those populations. Trapping requires a varied duration of time between setting the trap and collecting the catch, requiring longer wait times and more trips on the boat. Traps lost at sea, either by storms or lost buoys, can result in "ghost fishing" where the gear continues to fish unattended; however, advances in materials have created deteriorating traps that rapidly break down if they are left at sea. 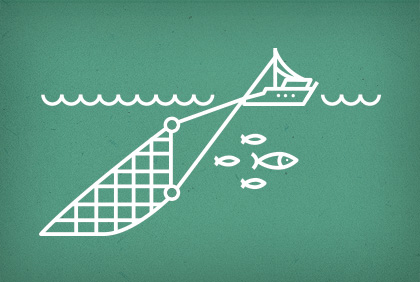 Purse seine is a long wall of netting hung vertically in the water that is used to encircle schools of fish. Seine nets are framed with a floatline at the top and a weighted line at the bottom. Using a drawstring, fishermen can purse the bottom of the net to herd the fish into the center of the net. This technique is used to catch schools of fish that live near the ocean surface. Pros Excellent method for catching schools of fish. Since schools of fish are targeted, incidental bycatch of species outside of the targeted school is usually minimal. Cons Seining for large quantities of a single species can become unsustainable if the population of that species cannot withstand it. Rod & reel fishing is practiced by people around the world for recreation and commercial use. 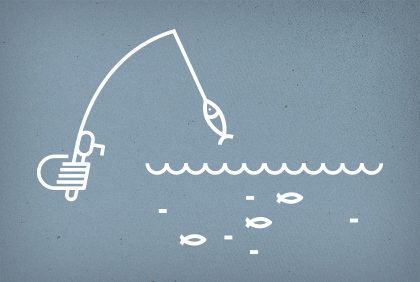 This is a highly targeted method of catching specific fish. 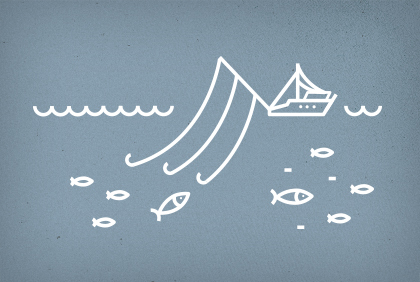 In many fisheries it allows fishermen to catch fish selectively, reducing bycatch and improving the quality of the fish available to consumers. While it requires more time, the impact and rate of extraction are minimal, which is good for all fish stocks. Pros Bycatch is minimized when using rod & reel because fish that are landed incidentally can oftentimes be thrown back with minimal harm caused to them, especially smaller fish that are released to live out their lives and reproduce. Cons Rod & reel requires a lot of time investment for each individual fish that is caught. Because fish are only caught one at a time, it makes the market availability lower and cost per pound higher. Longlining uses a main line with smaller lines attached loaded with baits separated at regular intervals. The main line can be placed near the surface for fish such as albacore tuna and swordfish, or by applying weights it can be laid near the bottom of the seabed for sablefish and rockfish. Longlines can be laid from small rowing boats as well as from larger vessels. Pros Effective method for catching deepwater species such as sablefish and rockfish with relatively low levels of bycatch. Cons Lines take a long time to bait! Bycatch of marine mammals, sea birds, sea turtles, etc. may increases if the longline is placed near the surface. Bottom trawling consists of towing a trawl (fishing net) along the seabed or just above the seabed to catch fish and/or shellfish. The bottom trawl consists of a cone-shaped net body, which traps the catch. 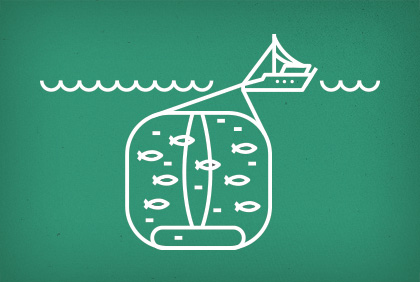 The size of the net can be adapted to the vessel size, but trawl boats based in Monterey Bay are usually larger vessels. Pros Efficient and effective method to catch groundfish that are often inaccessible by other methods. Provides the market with larger volumes of seafood. Cons Bottom trawling sometimes results in higher levels of bycatch than the other methods and may alter the seafloor structure. However, recent changes in management and improved nets have dramatically reduced environmental impacts. 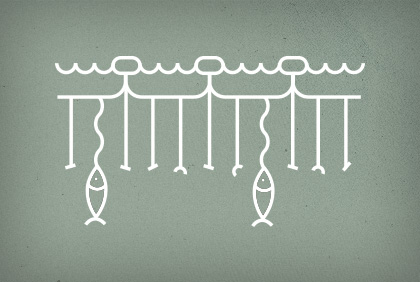 Gillnets are vertical curtains of netting suspended by a floatline, which could be anchored to the seabed or allowed to float near the surface. Gillnets are inexpensive and are thus ubiquitous among artisanal fisheries worldwide. 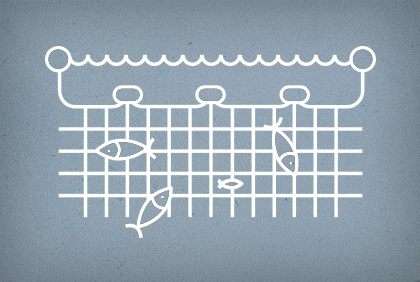 The netting is often made of nylon, making them practically invisible to fish, which swim into the netting wall and become entangled. Pros Inexpensive technique capable of catching schools of fish. Cons Bycatch of medium to large marine species like sharks, turtles, and small marine mammals is possible.